You went on to become one of the discoverers of the maser, and then the laser. How did you wind up in the field, just following through on what had interested you in your work at the Bell Labs? This is typical of new science. You follow a path, it's a path nobody else has followed. You are an explorer. Really, science is exploring, you look for new things. You look at new things and you never know just what you're going to find. I could guess. I explained to Bell Laboratories that they should let me work on the interaction of microwaves and molecules, because microwaves are important to communication, and I felt the molecules could affect the microwaves in ways which could be useful. So they allowed me to do that, and that became a very interesting aspect of science, microwave spectroscopy. I wrote a book on it and we learned a lot about molecules and nuclei from that. But I wanted to get to shorter wavelengths. Microwaves have wavelengths anywhere from maybe this long [indicates distance of several feet] to this long [indicates less than an inch], and we were working then with wavelengths of maybe half an inch. I wanted get to shorter wavelengths, because the effects got more and more strong, more and more marked and interesting as we got to shorter wavelengths. Nobody could make the short wavelengths. So I worked and worked trying to get short wavelengths. By then I also had gone to a university. I did get a job in a university after doing microwave spectroscopy at Bell Labs. There were more jobs after the war, for one thing. Furthermore, I had developed a little bit of a reputation and knowledge about some special things, so I got a job at Columbia University. I worked very hard there on microwave spectroscopy, trying to get shorter waves, and I tried several different things which sort of worked but didn't work very well. I kept thinking about it for several years. The Navy knew I was thinking about it. They asked me to head a national committee to try to investigate how to get shorter waves. We traveled all over and visited labs. It just wasn't getting anywhere, so it was tough, but I felt [it was] very important and I kept working at it. And then the maser came about [when] it was what was to be the last meeting of our committee. Our committee said we weren't getting anywhere -- we were meeting in Washington -- and I woke up early in the morning worrying about it. It was a nice morning, so I got up and I went out in the park and sat down on a park bench by the azaleas; a beautiful morning. And I thought, now why haven't we been able to do this? I thought out all the things we'd tried, trying to make very small little electronic amplifiers, and so on. And nothing could be made quite that small and still have power in it. And I thought about other things I had tried and they didn't work. I thought about using molecules and I said, "Well now, molecules oscillate very fast and they produce radiation. After all, atoms produce light, very short wavelengths. We ought to be able to use those"; but I'd thought about this before. There is a law of physics called the second law of thermodynamics. It says, to get radiation from something, you have to heat it up. You have to heat it hotter and hotter to get more and more radiation. And it was clear that if you heated it hot enough to get very much radiation of this type, the molecules would just fly apart. So the second law of thermodynamics says you can't get more than a certain amount. "Now wait a minute, the second law of thermodynamics, that doesn't have to apply! That assumes everything is a warm temperature, but if you don't have things that are just heated, you pick out things with special energy; the law doesn't have to apply. Wait a minute now!" And I suddenly saw where we could pick out molecules with a lot of energy and use these selected molecules, then send them into a cavity where the rays would bounce back and forth and take the energy out of the molecules. Now, fortunately, I had known something about beams of molecules, because that was being worked on at Columbia, and I had just been in contact with all the right things, with the engineering and resonant cavities and so on. So I took out a piece of paper and just scratched it out ... "Now let me see, will this work?" I put down numbers: "Can we get enough molecules? Yes, it looks like it will work." And I was just absolutely elated. It was just, "Hey, this looks like it might work!" Well I couldn't be sure. I thought, "Well, it'll be hard, but I think it might work. And so I went back to my hotel room and Art Schawlow, a friend of mine who became my brother-in-law, had been working with me. I told him about it and he said, okay, well maybe. And so that's how the idea started, the whole thing. And this coming together of the ideas for the maser in turn led to the development of the laser. That led to the laser. They're basically the same idea, that we get energy from molecules and atoms by picking out certain ones that have excess energy and then letting the waves interact with them and take the energy out of them, and that amplifies the waves and makes them go bigger. The laser is exactly the same idea. I wanted to get down to wave lengths about a millimeter, a hundredth of an inch or something like that. Now those are pretty long light waves. Light waves are more like twenty thousandths of an inch or something like this, you see, they are much shorter. And so it was a long time before I thought we'd get there. I wasn't sure we could get there, but eventually, after working on the maser, we got that to work. I had a student who worked on it. He worked for about two years and he finally got it working. And then everybody got excited and there was lots of work on it and development. Nobody thought we'd get down to light waves, but I thought, gee, I really want to get to shorter waves, and how to do that? So I sat down at my desk and thought about it and wrote down all the numbers and said, "Now what can we ...?" I said, "Well now, hey, wait a minute. We can get down to light waves, I think! Yes --" and I worked it out; yes, it looked like it. Nobody had imagined we could get to light waves, and suddenly I realized we could; and so it was the same process, but just pushing it further and further and on down to light waves. So now we have x-ray lasers, infrared lasers, and masers. See, the word "maser" stands for Microwave Amplification by Stimulated Emission of Radiation. That is, the radiation stimulates the molecules, makes them give up their energy. So it's Microwave Amplification by Stimulated Emission of Radiation, an acronym, MASER. Laser is the same thing, Light Amplification by Stimulated Emission of Radiation. My students kept making up these things: for infrared they said, "Oh, that's an 'iraser.'" And gamma rays, if you made gamma rays that would be a "gaser." In your book, when you talk about doing science, you pick up a metaphor or an image from your childhood and you say, "We explore. What path to explore is important, as well as what we notice along the path. And there are always unturned stones along even well-trod paths. Discovery awaits those who spot and take the trouble to turn those stones. In that case, one may see what no one has seen before and some aspects of maser and laser discoveries, such as the remarkable pure frequencies produced, or the enormous concentration of power and its effects, also fit this image. We had to undertake making masers and lasers before these phenomena were clearly seen." Well, that's quite right, and that is the nature of science: you explore new paths. And also, [on] the paths that have been explored, there are frequently things that people have neglected and forgotten about, and you look at a new corner, turn over a new stone or something, you see something. And the laser really fits that, because light was an old field when the laser came along. It was an old field. People thought they understood light, it had been worked on for many years. Even when I was a student in the 1930s, light was considered to be understood and everybody knew about light and there wasn't anything much new to come out of it. It was useful and we use it all the time, but nothing much new was there. On the other hand, once the maser and the laser came along, we were using ideas which at least a few people had known about but had never recognized how to put it together and how to make it useful. And that's why I say you're turning over a stone, you see the right thing, and then you go on from there. So the laser completely changed the field of optics. Then, the field of optics became an exciting new field again with lots of new discoveries, and we still are discovering really wonderful new things in the field of optics now. 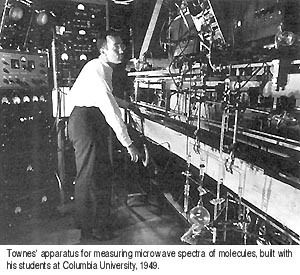 Microwave Spectrometer: "Townes' apparatus for measuring microwave spectra of molecules, built with his students at Columbia University, 1949." 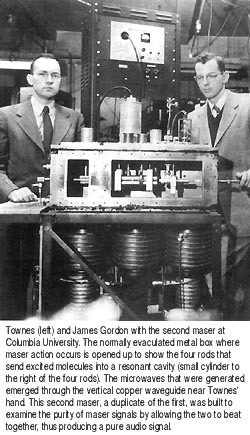 Maser: "Townes (left) and James Gordon with the second maser at Columbia University. The normally evaculated metal box where maser action occurs is opened up to show the four rods that send excited molecules into a resonant cavity (small cylinder to the right of the four rods). The microwaves that were generated emerged through the vertical copper waveguide near Townes' hand. This second maser, a duplicate of the first, was built to examine the purity of maser signals by allowing the two to beat together, thus producing a pure audio signal."